More than 400 acres of land around a northern Sierra Nevada trailhead is part of the Tahoe National Forest. The Trust for Public Land and Truckee Donner Land Trust bought the private property for $2.1 million, then sold it to the U.S. Forest Service. 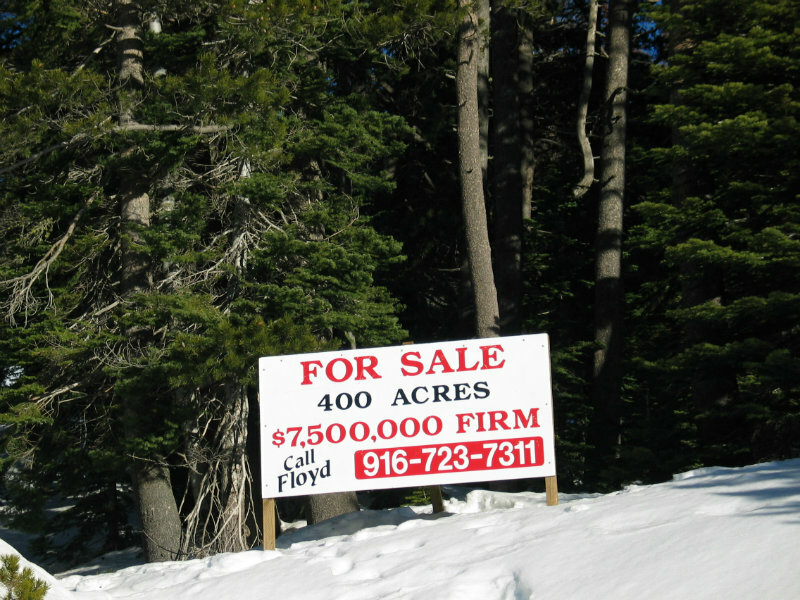 The Trust for Public Land and Truckee Donner Land Trust bought the property for $2.1 million, not for the $7.5 million a "For Sale" sign on the land indicated. The organizations then sold the 412 acres to the U.S. Forest Service for the same amount they paid for it. "Our mission is to protect land for people and this is a great example of that," says Gina Fromer, California Director of The Trust for Public Land. "This forever protects a beautiful doorway to one of the most stunning landscapes in the northern Sierra." Trust for Public Land Project Manager Markley Bavinger says instead of a resort or other development on the acreage, it will now provide wildlife habitat and improve access to popular backcountry trails and the Pacific Crest Trail. "This is really one of the premier gateways into the Tahoe National Forest,” Bavinger says. "It accesses some of the most exquisite backcountry for all season users and is, in the summer months, traveled by upwards of 300 people a day." Bavinger says there's a portion of the Pacific Crest Trail that crosses the property. "So this project protects important view sheds for a very popular part of the Pacific Crest Trail," she says. "And importantly, it opens up the possibility of establishing a new trailhead north of Interstate 80, for the Pacific Crest Trail." Bavinger says there is access to the Pacific Crest Trail on the south side of Interstate 80, but people then need to go through an I-80 underpass to get to the northern section of the trail. The Pacific Crest Trail Association says adding the land to the forest will protect views and improve access to the PCT. "Thanks to the work of many of our partners, we are excited to add this portion of Castle Valley to the Tahoe National Forest," says Eli Ilano, Tahoe National Forest Supervisor. "This area contributes to the protection of the South Yuba River watershed, provides important wildlife habitat for a number of species, and adds outstanding recreational access and opportunity to the public." The purchase of 412 acres protects the beginning of a well-used, year-round trail network which leads people to some of the most popular and easily accessed backcountry in the northern Sierra, including Castle Valley and Castle Peak, the Sierra Club’s Peter Grubb Hut, the Hole in the Ground trail and the Donner Lake Rim Trail, according to the two land trust groups. The $2.1 million used by the U.S. Forest Service to purchase the land from the two groups comes from the federal Land and Water Conservation Fund. Bavinger explained the program provides funding for land protection efforts. "This property and project has been, in the eyes of many, a priority for decades," Bavinger says. "It's been a long, and finally, a fruitful journey, for all of us." California enters spring with 55 percent of the state in extreme drought, mostly in the central and southern part of the state. A bill introduced in the California Assembly would ban certain rat and mouse poisons that harm people and wildlife. The U.S. Bureau of Reclamation says some farmers in California will get none of the water they've requested in 2016 and others will get their full allocation. After the season’s last Sierra Nevada snow measurement showed near normal snowpack in the north, one California water agency suggests conservation mandates should be rescinded or eased for the region. Volunteers will help improve the American River Parkway as part of a "day of service" on the César Chávez Day holiday. Storms have pushed the Sierra Nevada snowpack closer to average and some California reservoirs are above historical average. But reservoirs and rainfall in Southern California are not doing as well. The American Lung Association in California says climate change is causing the state's air quality to deteriorate. Pollution from abandoned mines in the Sierra Nevada could threaten California's primary water supply.